In April 2013, there were 1,937 copies of the Nissan Leaf sold in America. This is a decline from the 2,236 Leaf EVs sold last month but with an improvement of over 400% compared to the number of Leafs (Leaves?) 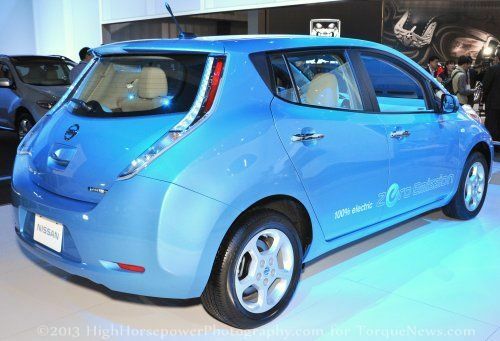 sold in April 2012, Nissan’s all electric Leaf finally appears to be headed in the right direction. More importantly, 1,937 units sold for the Nissan Leaf was more than enough to comfortably outsell the Chevrolet Volt that has dominated the segment over the past 18 months. General Motors sold 1,306 examples of the Chevrolet Volt sold in April 2013 – marking the 5th worst monthly sales total for the electric Chevy since the beginning of 2012. April was also one of the worst months for the Volt in 2012 so it doesn’t come as a huge shock but with the Leaf showing dramatic growth in a month where the Volt has fallen – GM will most certainly be looking to help the Volt climb back into the driver’s seat as we get into the warmer months. In 2012, the Volt started a powerful climb to record months starting in May so the next few months should go a long way in helping us forecast which mainstream EV will take the title for 2013. Fortunately for General Motors, the Volt had a strong enough start to 2013 and Nissan struggled enough in January and February to allow the Chevy Volt to hold onto a slim lead in annual sales. There have been 5,550 copies of the Volt sold thus far in 2013 while Nissan has sold just 5,476 Leaf EVs in that same period. However, if the trend from the past two months continues, Nissan stands a very real chance of claiming the EV segment lead that it hasn’t held since 2011. While the Nissan Leaf posted the biggest EV sales numbers for the month of April 2013 – easily beating the Chevrolet Volt that has been the EV segment top dog more often than not over the past two years – 1,937 units in the month converts to roughly 484 units per week. Tesla claims that they are selling around 500 units per week so we are led to believe that there are about 2,000 examples of the all-electric Model S reaching new owners each month. Those figures would be enough for Tesla to claim the title of America’s bestselling EV in April 2013 (and in other months where numbers across the board are comparable) but Tesla does not offer actual sales figures. Their vague representation of sales figures are not enough (in my opinion) to be considered side by side to those automakers who are fully transparent with their sales reporting. Should Tesla begin reporting their sales figures each month like all of the mainsteam automakers, the Model S could very well become the bestselling EV in America but so long as Tesla continues to hint to their monthly and weekly sales – the luxury EV builder will have a hard time proving that they offer America’s top electric vehicle. Unfortunately, there are a handful of vehicles that could technically compete with the Nissan Leaf and the Chevy Volt for the monthly and annual sales title but automakers don’t like to reveal the figures for their lower volume vehicles. Once all of the automakers offering electric vehicle make public their EV sales figures, those models could knock at the door of the Leaf and Volt. I noticed in an another TN story today that GM's chairman predicts the Volt will drop in price "and become profitable" sometime soon. I think the article alluded to that being "next year." Maybe GM doesn't have anything left to prove with the Volt and is going to stop trying so hard to sell it - at a loss. If they see a development coming that allows them to sell the car without taking a loss, and if the regulators are not on their back, what is the point of pushing the Volt now? In fact, why not jack the price UP until the big breakthrough comes? I'm with you on Tesla. Love the car, but I don't trust any of the figures they allude to. I do think you will soon need to include some Fords and Hondas in your monthly running battle for sales.